Garden mums – fall winners! While some people may be sad to see the tail end of the summer flowers; many of us are looking forward to fall garden mums. 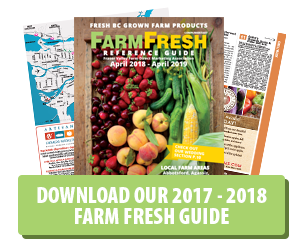 Hundreds of hardy cultivars provide a vast array of colors and bloom shapes. The blooms last for weeks, not days, and the sheer number of flowers per plant will convince anyone that this flower really likes to show off. A plant that really pulls its weight in the garden and is truly the diva of the fall garden and decorating. 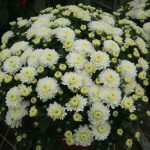 Chrysanthemums and garden mums have an incredibly long history. The chrysanthemum was first cultivated in China as a flowering herb and was described in writings as early as the 15th Century BC – that’s 2,500 years ago! 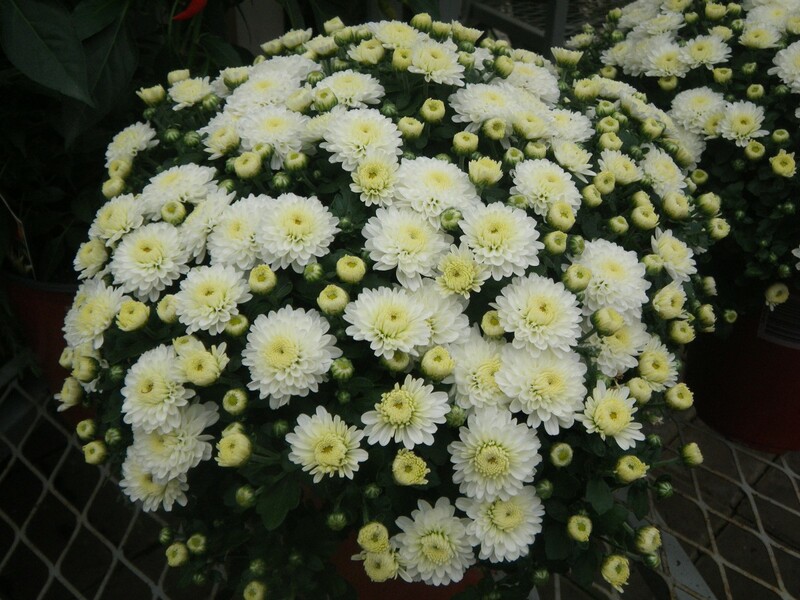 Around the 8th century AD, the chrysanthemum appeared in Japan. So taken were the Japanese with this flower that they adopted a single flowered chrysanthemum as the crest and official seal of the Emperor. The Imperial Order of the Chrysanthemum continues to be the highest Order of Chivalry in Japan. The chrysanthemum was first introduced into the Western world during the 17th Century. Botanically speaking, garden mums are a little confusing. In 1753, the renowned Swedish botanist Karl Linnaeus called them Chrysanthemum – Greek meaning gold flower. An accurate description the older species that were a usually a golden colour. 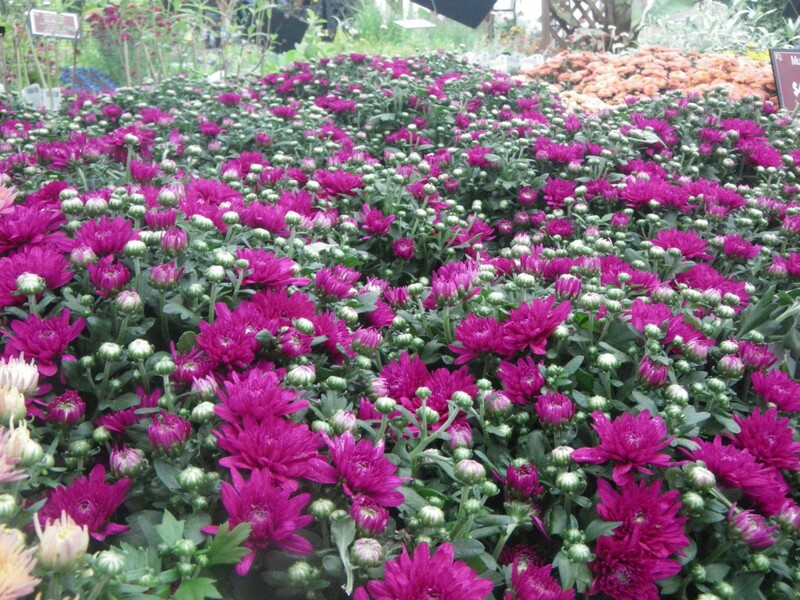 Today garden mums are classified as Dendranthema X grandiflorum. This translates to “tree flower” and “grand flowering”. Someone from 2,500 years ago would be hard pressed to recognise the modern-day garden mum. Extensive breeding programs around the world have produced amazing flower shapes and colours totally different from the original small golden flowers. Flower shapes and petals include: decorative (incurved or reflexed), cushion, aneome, daisy, pompon (ball), button, spider, single quilled and spoon. Colours include white, cream, red, brown, bronze, butterscotch, red-orange, orange, yellow, pink, lavender, purple and red-violet, as well as bi-colors. 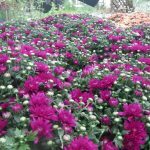 There are so many varieties of chrysanthemums today that a system of classification based on the type of florets and their growth pattern is used to categorize and identify them. 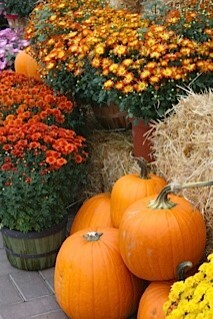 Garden mums are a fall decorating staple along with pumpkins and gourds. 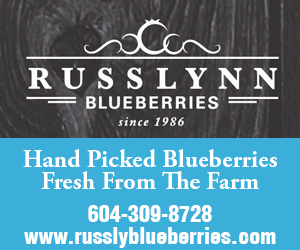 They’re perfect for mass plantings or for filling holes in the garden. 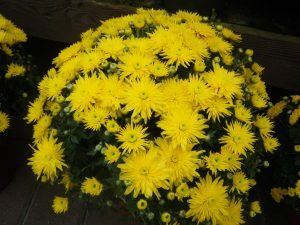 Garden mums also make great container plants. They’re just right for popping into a container, lining up in a row in a window box, or placing in the center of a mixed container with trailing foliage plants all around. 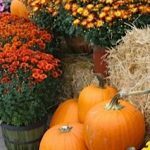 Whether you’re looking for a quick splash of color, a fixture for your border or a partner for your pumpkins, garden mum are the pick for a fabulous fall decoration and flower.